In homage to the gorgeous blueberry-pecan galette that graced the cover of Bon Appétit’s July issue, I took a stab at making my own healthier version with blueberries and nectarines. 2. On a lightly greased baking sheet, unroll the pie crust. 3. 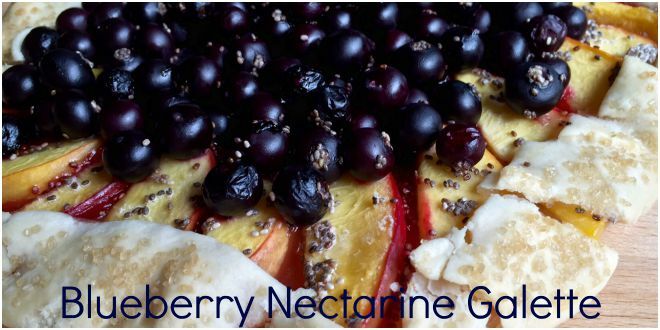 In a large bowl, combine the fruit, maple syrup, lemon and lime juices, cornstarch and chia seeds. 5. Fold the crust over the fruit, making about five folds in total. With your fingers or a pastry brush, spread the milk over the crust and sprinkle the sugar on top. 6. Bake for 25-30 or until the crust is golden brown. Allow to cool before slicing.